The last two months of 2009 were a mad-glass-dash. I had 6 pieces to coomplete for christmas, and at the very last minute (like, on the 22nd of Dec.), I added one more quickie suncatcher. I scanned it, printed it really lightly and then traced over it to get the pattern. It was a ton of work. At some point I realized that there was no way to do the image, as it appears above, and keep it to a 12×18 size. 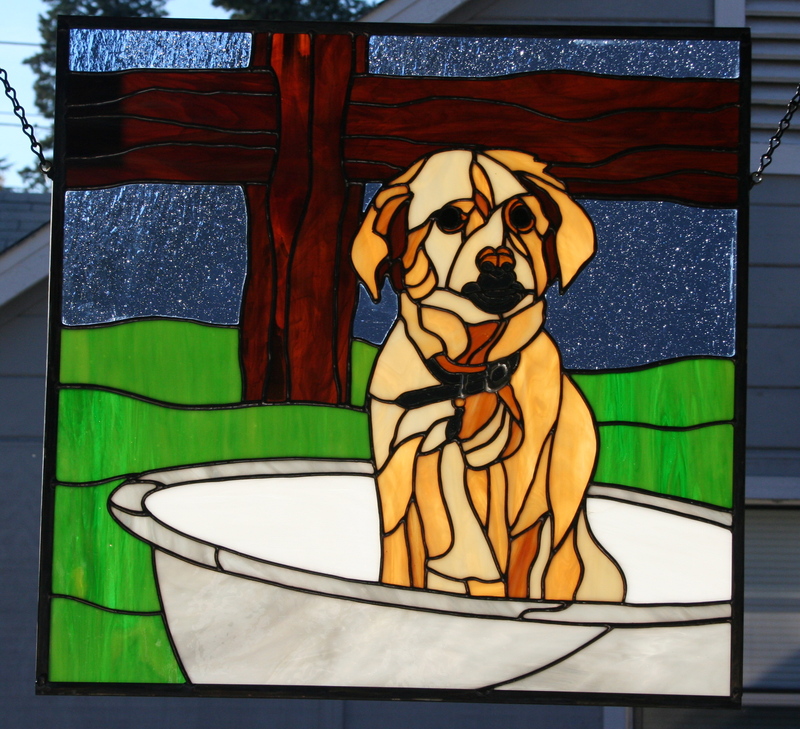 I experimented some more, and finally came up with a design that went in tight on the dog in the tub, and was 22×22. I just couldn’t get the detail I wanted having it any smaller. I ended up sketching in a background of grass, sky and a fence rail. the piece itself went fairly quickly, three weeks, once I had the pattern finalized. The next 5 pieces were all butterflies, and were to be gifts from a client for her co-workers. The camera was screwy so the photos didn’t turn out. So I have no shots of those. 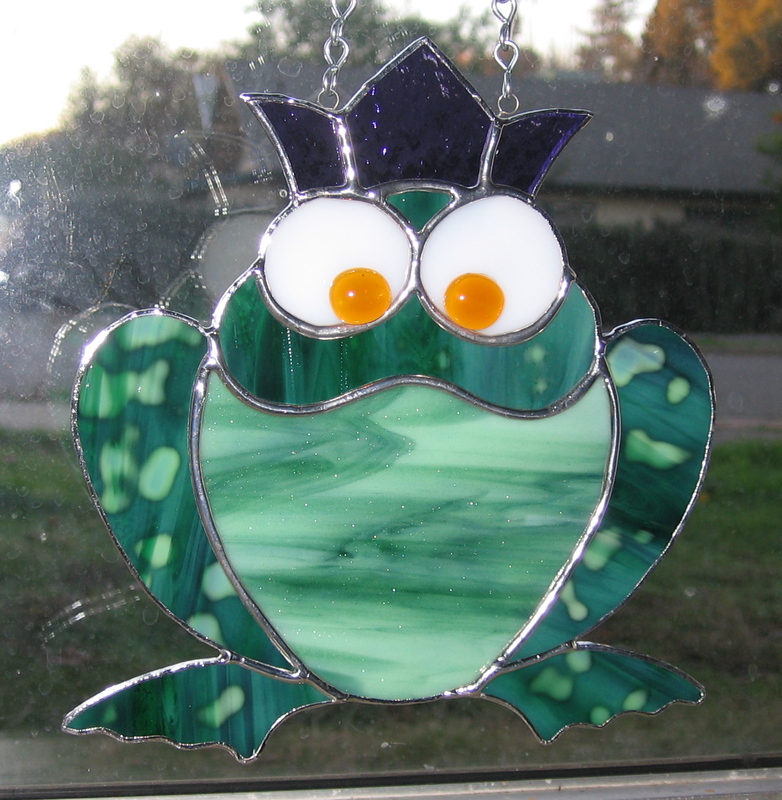 The last minute piece was a frog suncatcher. I got back from working in LA, on Tuesday night. I thougth I had tues night and weds night to complete it. After touching base with the lady, it turned out that they were leaving weds day to drive down to the familys. I flat out told her I couldn’t get it done in one day. I kept working on it however, and it was going well, so I decided to try to get it done that night. 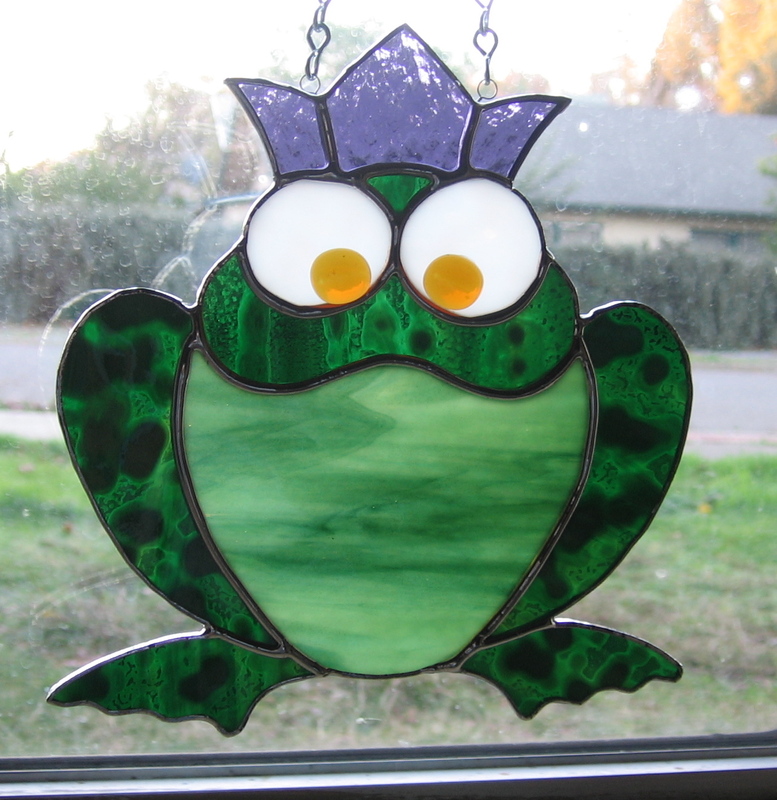 Five hours later, I called her and told her Froggy was completed. 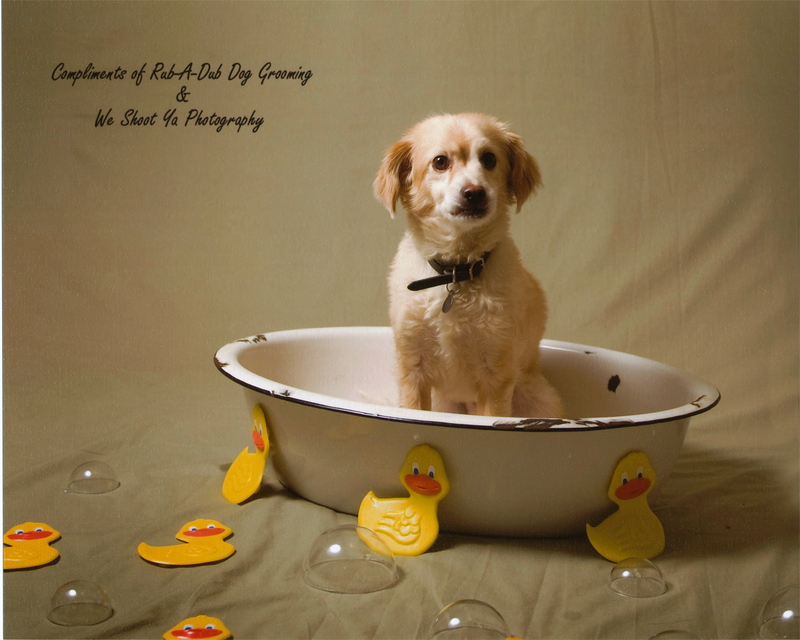 He turned out great, I kinda wanted to keep him. I used an existing pattern for a fan lamp. I changed the shape of his bottom, and changed the feet. The original feet were just blobs, I wanted froggy feet. Oh, and I added the orange jewel blobs to his eyes. The original pattern just had the giant white circles. Kind of creepy. I like that he turned out a bit cross-eyed. Last but not least, the glass door repair. This poor lady has been waiting for this for ages. She shipped it to me just after I agreed to do the Christmas commissions. Finally opened the box on New Years Day. It is an insert in a wooden frame door on an entertainment center. I haven’t done anything like it before, and it is proving to be a challenge. It has this weird brass came, that is lines with thin foam to cushion. 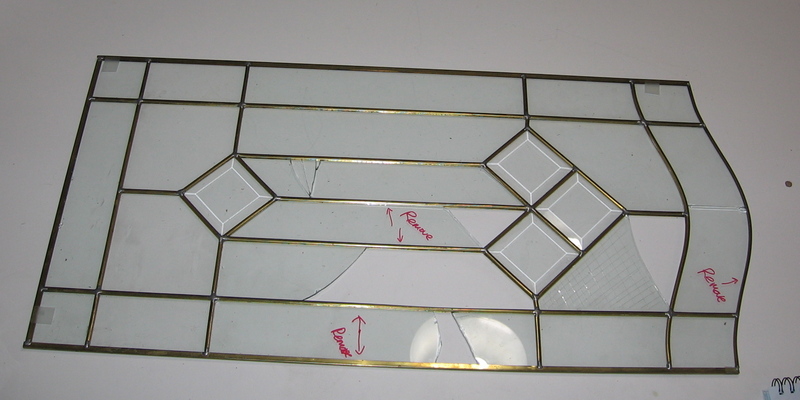 The glass is clear, and the piece is soldered only at the point were two or more pieces come together. I’m having to make patterns from scratch and figure out how to replace the broken pieces without taking apart the entire thing. I need wicking to remove the old solder, and my supply place took a week off for New year’s… I hate waiting. I am so impatient. Still, even after all the lessons I have had on patience. 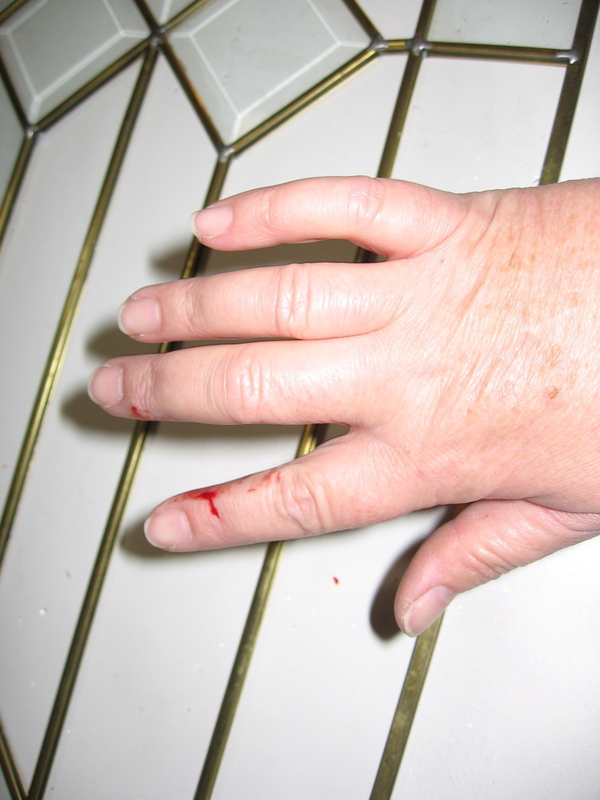 and here is a photo of my finger after scoring and removing all the glass… it doesn’t happen often. That’s all for now. Check back soon! ~ by kellig on January 4, 2010. Beautiful work. I really hope to commission you this year for myself or clients. We architects love glass, now it plays a slightly different role then it did in years past. i do have an old, old website, we are now building a blog for our new work of the last three years.